19th C. double sided Sailor’s Valentine with the sailor’s message of “A Present”. Each side is 9″. Made in Barbados and purchased there by the sailor. 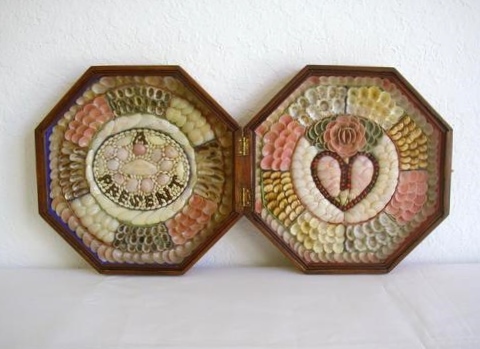 This Valentine and the following one are both painted with the same light salmon paint indicating to us that they were made by the same maker or have, at least, been together in a collection for a long time. All shells are intact and in excellent condition.